One of the cornerstone businesses at The Open Studio is The Pottery Studio. The Open Studio Pottery provides a place for people to tap into and express their creative ideas. As such, the work being done in pottery creation embodies the Mission Statement of The Open Studio. 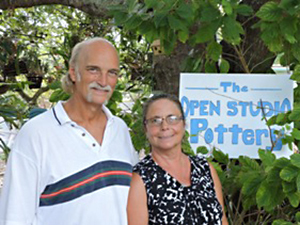 Managed by Englewood residents and potters Mary and Bob Weber, The Open Studio Pottery continues to grow and improve. Now in our third year of management, The Open Studio Pottery has become a popular place for residents and snowbirds alike to work at their craft. 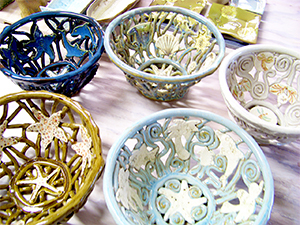 The Open Studio Pottery is a member-based program welcoming all levels of ability. Members get access to the studio and use of all supplies and equipment for a monthly fee. Clay and firing fees are in addition to the membership cost. 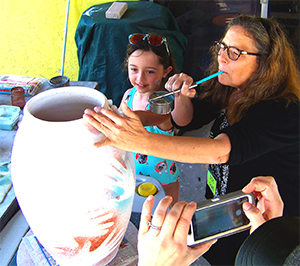 In addition to our membership program, The Open Studio Pottery offers classes and workshops on a variety of techniques, including hand building, wheel throwing, raku, pit firing, and other specialty techniques. Classes are open to members and non-members alike. Mary Weber serves as the lead instructor at The Open Studio Pottery , in addition to being studio manager. Mary's classes include the very popular Coastal Colander Bowl, Intro to Wheel Throwing, Kid's Mask, and Christmas Ornament classes. In addition to Mary, The Open Studio Pottery utilizes other qualified instructors both on a weekly and seasonal basis. Our classes and workshops are targeted to skill levels ranging from beginner to accomplished potter. outdoor work table to allow our members the ability to be inspired and create while enjoying our natural surroundings. If you have not been to The Open Studio Pottery in awhile, stop by and check us out. Ask for information about membership, classes, and fees. Gift certificates are available to the The Open Studio Pottery and make a great Christmas present. Stop by Tuesday thru Thursday from 10:00am to 3:00pm for more information. For group tours, picnics, and retreats, please contact our Administrator, at Email: admin@theopenstudio.org.